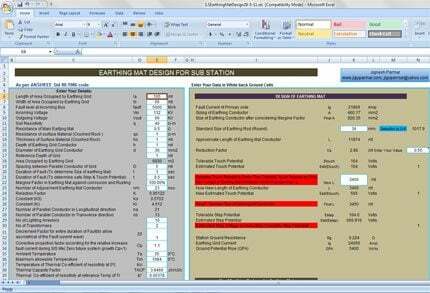 What is the tolarable value of GPR/EPR for earthing grid calculation? I want to give a seminar on grid Earthing..Can u give me detail info about it? I am not able to see the detailed drawing about construction of earth mat. A drawing shall be presented indicating driving/penetrating number of MS rod in ground and connecting all of them by a earthing flat/strip. Illustration of such drawing may help the young engineers to learn and execute. Could u please explain me how to do the earth mat design for 220/132/33 kV Outdoor GSS which have 5 steps (135m, 138m, 141m, 144m, 147m). Can’t do the Earth mat design separately for each step and finally connect each steps together. OR is it must to do the design for all the steps together? Since their is huge civil work in step 144m and 147m it may take some time, so we can start lower 3 level works if we can lay the earth mat. i) whether the each earth mat is to be connected. ii) for DC earthing separate mat is provided? iii) spacing between conductors and material?? Kindly explain what you mean by these terminologies, and where to get such inputs. (ii) Margin factor in earthing mat against corrosion and rusting. Is there a version for use in the UK? thanks for this page. ***** five stars !!!! Great Job man! Thanks a lot! could you put up an article for measuring the Earth Resistance, Step & Touch potentials, using a Injection transformer ? Thank you for this subject , i need to know how to determine required no. of earthing rods? Can u send me the details required to design an earth mat for 132/33KV Substation which the area consist of 12400 Sqm and 13620 SqM? Can u send me the details required to design an earth mat for 230/110KV GIS Substation which the area consist of 60by 75 mtrs?